I just did a reformat of my computer, I have Windows XP home. I have installed Microsoft Office, and everytime I open Word, I get an installation screen, and then I get the "Visual Basic Compile Error Hidden Module: Auto Exec" message. When I click "OK" I can use Word. When I close word I get the same Error message. I tried to do the Macro/compile repair from the repair I found in this website's search, but I do not see a normal.dot file to delete. I have no clue what is happening, and I am afraid I know enough to get me into trouble, but not enough to fix this problem. Pleas help. It took me 3 days to reformat and get all my programs loadded back on my computer. I really need to fix this because I am afraid it will lead to other problems. Your normal.dot is probably a hidden file on your computer. To allow you to see hidden files, open the Windows Explorer and click on the Tools...Folder Options...View menu item. Select the option for "Show hidden files and folders" -- it's about the tenth item from the top. If you want to delete (or rename) the normal.dot file, you need to close Word first. On my computer, the normal.dot file is in my C:\Documents and Settings\my Windows log-on name\Application data\Microsoft\Templates folder. Your location may be different--in which case do a file search in the Windows Explorer. Rename all normal.dot files you find to normal.old (or else delete them). Word will create a new normal.dot file to factory specifications the next time Word launches. If the problem still occurs when you launch Word, change your macro security to Medium using the Tools...Macro...Security menu item. Then ALT + F11 to open the VBA Editor and Control + R to open the Project Explorer (if it doesn't already display in a pane to the left). Click the + sign next to all files in the Project Explorer (should only be Normal.dot and the blank document), then double-click on the items you see. Please post any macros you find after double-clicking--you can probably delete them. Note that Acrobat 5 has a conflict with Word 2003 (later versions are OK). You will need to remove pdfmaker.dot from your start-up folder. Thanks for the reply. I did the first thing you said and deleted the normal file. Launched word, and got the same thing. I then went into the macro and did what you said, and no macros show. I don't have Acrobat 5, I have 7. Still having the same error message. I am sorry, but I am just so frustrated! I am afraid this will just be the start of more things to come! Please help. In the Tools...Templates and Add-ins menu item, are there any items shown in the "Checked items are currently loaded" field? When you were in the VBA Editor, were there any projects there other than Normal.dot and Document1? 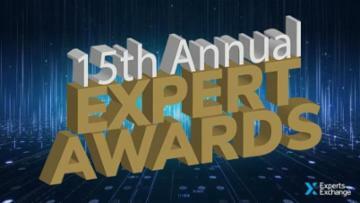 The results are in for the 15th Annual Expert Awards! Congratulations to the winners, and thank you to everyone who participated in the nominations. We are so grateful for the valuable contributions experts make on a daily basis. Click to read more about this year’s recipients! Templates and add-ins the pdfmaker.dot is checked...it that the problem? VBA Editor there is - Normal "this document"
by the way, my name is Kim. Sorry, I usually sign my name on all emails...just goes to show you how nuts I feel. Which version of Word do you have? I'm betting you have Norton Antivirus, which is known to cause problems with Word 2000. If not, there are a number of other programs that are known to cause problems as well. Below are some relevant hits from the Microsoft Knowledge Base. In most cases, the remedy is to move some files out of your Word start-up folder. To find the location of this folder, launch Word and open the Tools...Options...File locations menu item. You may need to click the "Modify" button to be able to see the full path. I had Norton, but uninstalled it. I will try the links and let you know what I come up with. IMHO You have an AutoExec macro in one of your global add-ins. Did you solve your problem? If so, what was the culprit? Turns out it was the pdfmaker in the start up file. But now I found I have an error message in my pulisher when I use the clip art! I am uninstalling my office suite and starting over again! I have no idea what is going on, I have done reformats on my computers every year for the last 3 just to get things cleaned up since I get so many viruses and trojans. This is the first time I have had these problems. It is driving me nuts! Well reinstalling didn't clear up my publisher problems. At least the word problem is gone. Gotta figure out this publisher problem now! I too had the same problem with MS Office 2003 and Adobe Reader. I did a search for pdfmaker. * and found them in Startup11 folder of Word and Excel and deleted them both. Then opened all of the MS Office programs and no error in Visual Basic. I suggested that above (13138837) but apparently they did not attempt it...told him to remove all files from startup folder....but chose to accept byundts answer for some reason....dealing with Norton. Go figure.